Brian May recorded lead guitar parts for Guns N' Roses' track Catcher N' The Rye way back in 1999. The song has been confirmed to appear on the ridiculously long-awaited album Chinese Democracy, but a leaked sleeve note suggests that the Queen guitarist's contribution has been removed. First I want you to know that I'm a huge fan of your work. I grew up with all of your music and still love listening to it. Now, ChiDem is about to hit the market and the booklet is leaked. Do you know that you're not on CITR anymore? What do you think about it? Makes me a little sad as I was looking forward to hear your part more clearly. I'm one of the webmasters of the German GN'R-Board and just wanted to know your opinion. I'll keep it for me and I won't tell anyone. "Ah ... well, I did not know this! Thanks, Thomas. Well, it is a shame, perhaps ... I did put quite a lot of work in, and was proud of it. But I could understand if Axl wants to have an album which reflects the work of the members of the band as it is, right now. I do have mixes of the tracks with my guitar on, work tapes at the time, but they will remain private, out of respect for Axl. Thanks for your kind wishes, Thomas. 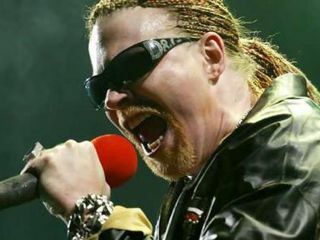 A grand total of 18 musicians contributed to Chinese Democracy during the 14 years of hard graft it took Axl Rose to finish it. Whether the likes of Jane's Addiction's Dave Navarro or basketball/rap legend Shaquille O'Neal have also felt the blade of Axl's axe remains to be seen. UPDATE: read MusicRadar's Chinese Democracy review.